Just a quick post while I take a break from launch prep. Tomorrow, April 23, will be my first launch of the season, and today I finished three new scratch built rockets, just in time. This is a design from Mike Westerfield's book, Make: Rockets: Down-to-Earth Rocket Science. The camera payload bay, which Mike calls "ICU2," I've built before, and lost, on a rocket of my own design. I made a few enhancements to the design. The fins are mounted through the wall of the airframe and attached to the motor mount. The fins are also beveled on the edges, and tapered radially, meaning they get thinner near the tips. I was able to do this pretty easily by building the fins up from three pieces, and will do a more detailed post about how to do it. It also makes the fins really strong. The payload tube is held on to the conical transition piece with removable plastic rivets. Static port holes in the payload tube allow an altimeter to take accurate readings (actually, the camera hole is probably more than sufficient for this purpose, but I added static ports anyway). The original design is a standard E-motor length model rocket motor mount with a hook. I kept the hook and thrust ring out, and added a screw-on motor retainer, so I can fly the rocket with any 24mm motor, regardless of how long it is. I can't wait to fly this one a few times tomorrow. This simple design was one I did for a fundraiser at the Bloomington Playwrights Project, and I decided I wanted my own. It's a BT-56-based design, which will fly on D motors. There's no launch lug - the rocket has tiny micro rail buttons for use with a MakerBeam launch rail pad. I was going to go with black and red, but I already have a Der Red Max, and a lot of red, black and white in my fleet. So I went with blue and gold for this one. Another fundraiser rocket, this was originally called "Keith's Rocket" here on the blog. Even though it's pretty small - BT-50 body and BT-60 payload - I really liked the design, so I built one for myself. I also decided to add a booster, because why not? A booster stage looks really cool on this rocket, and it will make the rocket fly higher. The fins on this are 1/16 inch basswood, and sanded into airfoil shapes. Again, the payload has static ports for use with an altimeter. I'll stage it with either B or C motors, depending on the wind and how confident I feel. But I really like the way this one turned out. Until recently, I had a rocket painting problem. To paint a model rocket, you need some way to hold the rocket, while simultaneously not touching the surface to be painted. The solution for most rocketeers is to use some kind of painting wand. The simplest painting wand is made of rolled up newspaper, stuck into the top of the body tube. I usually use dowel rods with used rocket motor casings on top. Regardless of what kind of wand I was using, the problem was the same: I spray a coat of paint onto the rocket and then wonder Where do I set this thing while it dries? I had a couple of hack solutions which usually worked, but made me nervous. ...or I would stick the wand into a large empty food can, wedged in among a bunch of craft sticks, with a large clay weight in the bottom to keep the can from falling over. Obviously, neither solution was ideal. For one thing, if I were painting more than two rockets at a time, I'd have to find something else. For another, both of these solutions mean that I risked taller rockets falling over and damaging the paint. I kept thinking I'd need to build some kind of stand. For that, I thought I'd need to get some wood, drill some holes, find someone with some kind of power saw which I don't own, design a stand which would hold X amounts of rockets at one time, and find a place to store the finished stand. Then, I realized this doesn't have to be complicated - PVC is the answer! The solution was so simple, I kicked myself for not thinking of it a year and a half ago, when I first got started building. At the top of the page, you can see what I came up with - a PVC stand which will hold up to four rockets at a time. But the stand is also expandable - you can make one large enough to hold a bunch of rockets at a time, which is ideal if you build a lot, or if you are incorporating rocketry into a classroom setting. The paper wand is a simple solution for your first rockets, and is mentioned in The Handbook of Model Rocketry. You just roll up a newspaper, stick it into the front end of the rocket, and you're good to go. It does work great, especially if you're painting your first rocket and don't have any used motor casings yet. But there are a few drawbacks. First, you're holding the rocket from the forward end, which makes painting the trailing edges of the fins tricky, especially with longer rockets. A wooden dowel wand gets inserted into the motor mount on the back of the rocket, so you have easy access to the fins when painting. Second, there's the problem of where to put the rocket while it dries. Third, if you squeeze the wand too hard, it will kink and flop over, so you can't hold the rocket upright. This might not be a problem for you if you're an adult with reasonable manual dexterity, but from teaching rocketry to kids, I can tell you that kids get nervous the first time they use spray paint. They tend squeeze the wand so tight, and they might shake and get sweaty palms, and the paper wand just falls apart. The wooden dowel wand, on the other hand, is sturdy, reusable, gives good manual control (since it doesn't have to be handled gently), and gives you something to do with the dozens of used motor casings you'll soon have on hand. This couldn't be easier. Save a few used motor casings, and get yourself a pack of craft dowel rods, about 12-16 inches long. Craft dowels have all sorts of uses in hobby rocketry, so you will need some anyway. The ones I have are about 5/16 inch in diameter. 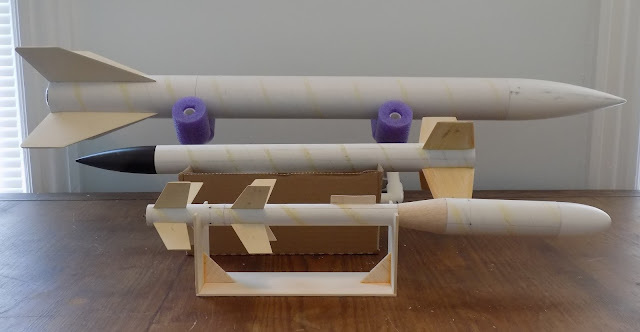 A 1/2 inch diameter dowel will just about fit perfectly into a motor casing, though you may have to sand the inside of the casing to get all the used propellant out of it. You need to remove at least some of the soot from the used motor casing. Unless the fit is too tight, you don't have to sand it perfectly clean, but you should at least knock out all the loose black stuff with a screwdriver, so you're not dropping ashes all over the place. If you are using 1/2 inch dowels, you can then use wood glue to permanently attach the motor casing to the dowel rod. But I prefer to use masking tape to build up the diameter of the rod, and then slide the motor casing onto the dowel. Sometimes a motor casing will get so caked with paint, you need to replace it. Since my painting wands aren't glued together, I can just take the motor casing off and put a new one on. Dowel rods aren't expensive, but this way I have less to throw away. The picture at the top of the page may be perfectly self-explanatory to you. But I never like to assume someone new to rocket building has prior knowledge of tools or materials, or building techniques, so I'm going to show you step by step how to build the stand, and how to expand the stand to hold as many rockets as you need. If you have a classroom with 22 kids and need a place to hold 22 rockets as the paint dries, this might be a good solution for you. To build the basic stand, you need the following parts, and one tool. *Note: If you want to build the expanded version of the painting wand stand, you'll need some T fixtures. Either elbows or T's will work for the basic stand, so get whatever is cheaper or more easily available. You can use a hand saw to cut the PVC, but as in the post where we built a rocket cradle, I find a PVC pipe cutter, available from hardware stores for not too much money (mine was about $12), to be much easier and cleaner to use. Start by cutting four 3-inch lengths of the PVC pipe, and inserting one piece into each end of the cross fixture. Cap the ends of the 3-inch pieces with the elbows (or T's), all facing the same direction - 90 degrees from the 3-inch pieces. Cut four more lengths of PVC pipe, at least 3 inches long. I cut a few even longer, so that larger or heavier rockets would have less wiggle room in the stand when drying. Insert these into the elbows (or T's), and you're done. You can cement the stand together with PVC cement if you want to, but you skip the cement, you can take the stand apart for storage, or moving to a new home, or to expand it for more rockets. Replace one of the elbow fixtures with a T fixture. The upright piece from the elbow will go into the T fixture. Cut another 3-inch length, and join it to the other end of the T fixture. Then, add another cross. Add three more 3-inch pieces to the cross, and finish with more elbows and upright pieces. You now have a painting wand stand that can hold up to seven rockets at a time! You can continue to expand the stand in either direction, using more T's, crosses, and elbows, to hold as many rockets as you need to. You can even expand the stand sideways, as long as you don't make it so wide that it's hard to reach rockets for adding coats of paint. This project was so, so easy, and so helpful. I built it a few weeks ago, and have since gotten so much use from it - not only for when painting rocket, but as a good place to keep a few rockets safely out of the way when cleaning my work space, and for when applying decals. I wish I'd thought of this before teaching a model rocketry camp last summer. This summer, I have an easy solution. Recently, on The Rocketry Show Podcast Facebook discussion group, someone asked about a photo. CG, one of the hosts of the show, was presenting at NARCON 2016, and needed pictures of me and of Gheem, the other host, recording the podcast. CG posted our pictures on the discussion group. Someone in the group asked, "In your pic showing you in your rocketry den, there is an apparatus that holds rockets horizontally and looks like it is made with PVC tubing. Where can I buy one of those?" That object is a rocket cradle, and you don't buy them. You make them. A rocket cradle holds a rocket on its side while you work on it, and keeps the rocket from resting on its fins on your work table. It can be very useful for when you're making fin fillets or applying decals, or even in the field when you're prepping larger rockets for flight. It's one of the easiest and cheapest pieces of equipment to make. Rocket cradles are even used in real rocketry, during construction, storage and transportation of rockets. Here are two images of the Iris sounding rocket in cradles. I'm going to show you how to make three versions of the rocket cradle. This simple rocket cradle is described in The Handbook of Model Rocketry. It's made from balsa wood, but can also be made from basswood, cardboard, foam board or whatever you have on hand that's flat and can be easily glued together. Balsa is probably the easiest material to use, and if you build your own rockets, you should have some on hand anyway. I used two pieces of 1/8 inch thick balsa stock, 3 inches wide. It's important that the ends be square, so if you're using scrap pieces with unevenly-cut ends, you'll want to square them up. One piece will serve as the base of the cradle, and the other will be the upright supports on the ends. I drew a dividing line down the center of the shorter piece I'd use as the upright supports. The upright support board is 7 inches long, which will give me two 3 1/2 inch tall uprights. I found the center of that dividing line, then marked spots 1 inch from either side of that center. This would give me a cradle with a 2 inch wide span. I then marked the board so I'd have lines stretching from the outer marks on the support center line to the center of the board, at a 45 degree angle. You can use a compass to do this, but I found it easiest to use the drafting triangle from a Crayola drafting toy I had as a kid. I always figured I'd have a use for that thing if I saved it, and it has come in handy since I started building rockets. You will end up with a square in the center of the board. With a hobby knife, carefully cut the centering line, so you have two even pieces. As with cutting all balsa, use a new, sharp hobby knife blade, and don't try to cut in one pass - use several, light strokes to cut the wood. You can lightly sand the cut ends so they're square if you need to. This balsa was very soft, so I got a jagged cut. The square has now become two triangles, hard to see in the above photo, but on the right side of the upright support pieces. Carefully cut the two triangles out with a hobby knife and a metal ruler. You can stack the two triangles together and sand the edges even, just as you would do with a set of fins when building a rocket. These will become support struts for the uprights. You'll be gluing the uprights onto the ends of the base board, and gluing the support struts to both pieces. I found the easiest way to do this was to glue the support struts onto the upright pieces first. You want to glue them flush with the bottom of the upright boards, and as straight as you can. Drawing a centering line from the bottom of the cut-out triangles on the uprights helps to align them. A piece of aluminum angle will help you get the support struts glued on straight and even with the bottom of the upright boards. When gluing on the struts, a double glue joint will make building easier. Apply a thin layer of wood glue to one edge of the support strut, attach it to the upright board where you want it, and then remove the support strut. Allow the glue to dry for a few minutes. Once the glue has dried a little, apply a little more wood glue to the same edge of the support strut. Again, you want a thin layer. Then, using your guide line and aluminum angle, attach it to the upright board. The double glue joint will grab much more quickly, and you won't have to stand there holding the piece in place as it dries. It will take only a moment of your holding it in place for it to stand up on its own. Repeat this for the second upright and support strut. Let the glue dry for a little while, and once it's relatively set, apply fillets to the joints, just as you would do with fins on a rocket. This will strengthen the joint, so the uprights don't fall apart when you glue them to the base. After the glue has dried for a little while - 30 minutes to an hour - you can glue the uprights to the base. The glue doesn't have to be completely dry on the struts, as long as you're careful not to break them off. Apply a thin layer of wood glue to the bottom edges of the uprights and the struts, and make another double glue joint. Again, a piece of aluminum angle or other square object will help you get the uprights on straight and even with the edges of the base board. The rocket cradle is complete. Allow it to dry thoroughly. Note: I probably made the base of this cradle a little too long. I built it just for this blog post. It's a 9-inch long board. This cradle is good for smaller rockets, and probably shouldn't be longer than 6 or 7 inches. See below photo. The Estes Viking is too short to be supported by the body tube. This is the cradle seen in the background of the Rocketry Show picture. It's made of PVC, and is pretty versatile. It can hold medium and larger rockets, and you can add to it or change its configuration to fit your needs. You see a lot of PVC cradles in online forums and at club launches. PVC is relatively cheap, useful for a number of rocketry accessories, and is pretty easy to work with. The tricky part is cutting it. You will need either some kind of saw or PVC pipe cutter. I have cut PVC with a hack saw before, but it's hard to cut it straight. When I realized I'd probably end up building a number of things from PVC, I went ahead and got myself a pipe cutter which can handle PVC pipe up to about an inch and a half in diameter. It's a large, ratcheting clipper which looks a bit like an angry parrot. Whereas a hand saw leaves the edges of the PVC jagged, requiring you to sand the cut ends, the pipe cutter makes a clean, straight cut. It cost me about $12 at a local hardware store. The cradle in the above picture is actually two parts, which can be moved relative to one another, and which don't take up much space when not in use. I'll show you how I made it, and some variations you may consider. You will also need one foam pool noodle, which you can usually buy for less than a dollar from spring through summer, and sometimes into the fall. It is important that the PVC fixtures be non-threaded. Some fixtures have threads inside them, to enable you to screw parts together. We want to be able to simply slide the parts together. The first step is to measure out eight 2 1/2 inch lengths of PVC pipe and cut them. Assembly is simple. Start by making the cross pieces. Put one 2 1/2 inch length of PVC pipe into each opening in the PVC cross fixtures. Attach T fixtures to the ends of two adjacent pipes on each cross piece, with the open ends of the T fixtures perpendicular to the cross piece. The cross pieces should now be able to stand on their own. With a hobby knife, cut four 2-inch lengths from the pool noodle. The lengths of pool noodle should fit right over the ends of the PVC pipe on the cross pieces. Now you're basically done. You can move the two cradle pieces closer together or farther apart depending on the size of your rocket. You might think you need longer lengths of PVC for the tops of the cross pieces. So did I, when I first started building this. But, unless you have a really fat rocket, it's going to nestle right in the corners of the cross pieces, and anything more on the upper arms is really just extra length. Now, these two parts will stand perfectly well on their own. But if you want to take this cradle out to a windy field, and need some more stability, you can add feet. Simply cut two lengths of PVC pipe for each T fixture foot, put them into the openings, and add a PVC end cap fixture. Now you have a sturdy pair of cradles which are still small and portable. If you want something even sturdier, or you simply want something that's one piece, you can join the two cross pieces with lengths of PVC pipe. In that case, you can use the T fixtures, as seen above, or you can substitute elbow fixtures, as seen here below. You could even add a third cross piece for really long or heavy rockets which need extra support. Simply use a T fixture to attach the middle cross piece to the longer pipe, and T's or elbows for the end cross pieces. You'll find this cradle to be a very useful tool. Serious rocketeers never throw anything away before considering whether they might be able to use it for rocketry first. This box once held a 12-pack of ramen noodles. Get yourself a small cardboard box. Find the mid point of two opposite sides of the box, and mark it with a pencil.. As with the balsa cradle, measure out an inch or so on either side of that mark. Then, as with the balsa cradle, draw two 45 degree lines inward from those outer marks until they connect. Cut out the triangles you've created with scissors. Now you have not only a quick and easy rocket cradle, but a box to keep parts in while you're working on the rocket. You can cut notches on the two far sides for longer rockets, and the two nearer sides for smaller ones. You can even cut multiple sets of notches, and have a cradle that can hold two or more rockets at a time. It's very satisfying to make a useful tool yourself, especially so inexpensively. And once you start using a rocket cradle, you'll wonder what you did without one.